holy happenings batman! in my masters-inspired self-absorption, i almost forgot to remind you about a fantastic show by an awesome australian artist, whose work has been more influential on my own than he probably realised. lucas ihlein, lucazoid to some, has been exhibiting the ‘sham piece at george paton gallery and it closes today! it’s the work which resulted from his residency back in 2006, in which he didn’t leave the boundaries of petersham, in sydney. the suburb in which i last lived in sydney. anyways, lucas blogged the whole process of really inhabiting his local neighbourhood, highlighting the goings-on of this funny little suburb and focused on the process of action and occupation as an art practice. his blog became one of two that properly elevated blogging as an aspect of practice (that, and the art life back in the day) and he continues to use it as one of the tools for action/process/fluxus works. today is the last day of his show, so you really should go to the gallery. end of story, really. 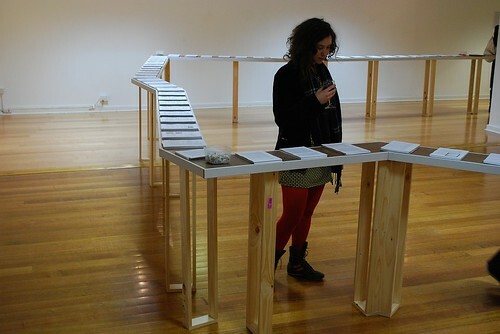 check out the ‘sham blog (in zine format, that you can make yourself) and his totally beautiful prints – done on the big fag press, you know – and feel good about the rest of the day, knowing that you can tell your grandkids that you saw lucas ihlein‘s the sham when it came to melbourne.